Last Thursday, Samsung started taking pre-orders in the U.S. for the foldable Samsung Galaxy Fold. Samsung limited the supply of the device, which allowed it to sell all of the units it made available for pre-orders even with a price of $1,980. Those visiting the website now will see a message that says, "Due to high demand, we are unable to accept any more pre-order reservations. We will alert you when Galaxy Fold is available." So by leaving your email address with Samsung, you will receive a notification once Samsung starts taking reservations once again. 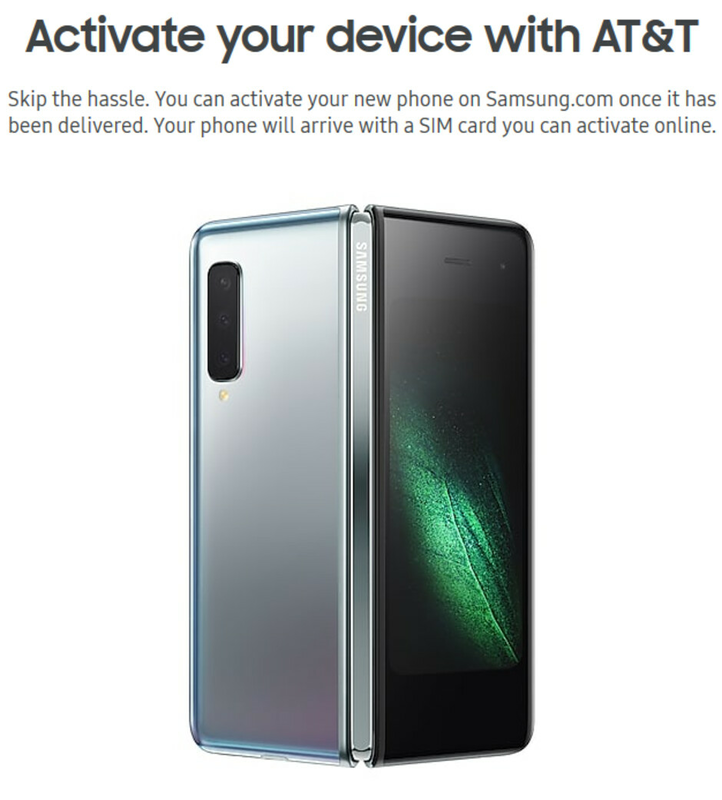 But a tip received by XDA's Max Weinbach from a developer who goes by the Twitter name of Oden (@odensc_) reveals a Samsung website where you can buy a Galaxy Fold right now without having to make a reservation or even leave your email address. The site allows you to select either T-Mobile or AT&T and also shows that the phone can be bought for 24 monthly payments of $82.50. 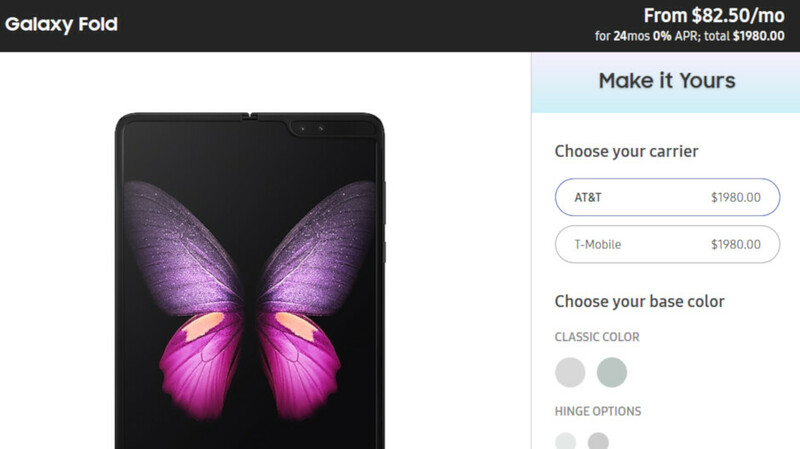 Oden also found that AT&T and T-Mobile each had only 4,500 Galaxy Fold units available for pre-orders. T-Mobile announced last week that it will be delivering the Galaxy Fold starting on April 25th. The phone will feature a 4.6-inch external display with an 840 x 1960 resolution. When the device is opened, it reveals a 7.3-inch OLED display with a 1536 x 2152 resolution. All models will be powered by the Snapdragon 855 Mobile Platform and will include 12GB of memory and 512GB of storage. There is a triple-camera setup on back (12MP primary + 16MP ultra-wide +12MP with 2x optical zoom) with dual selfie snappers in front. Keeping the lights on is a 4380mAh battery, and Android 9 Pie is pre-installed. Samsung only made 9,000 Galaxy Fold units available for pre-order in the U.S. The Samsung Galaxy Fold will be the first foldable smartphone to come from a major manufacturer. The Huawei Mate X, which folds outwards compared to inwards for the Galaxy Fold, will be released later this summer priced at the equivalent of $2,600 USD. We expect to see other manufacturers release foldable phones this year, including models from Oppo, TCL, Xiaomi and the new revamped version of the Motorola RAZR. This RAZR will be an Android-powered smartphone that will reportedly open up vertically to display a tall and thin 6.2-inch display, and could be priced in the neighborhood of $1,500. The foldable category could eventually return growth to a declining smartphone market. But right now, pricing is too high for anyone but first adopters to be interested in the new form factor. It could take two or three years before the pricing of these devices drops enough to interest most consumers. And with Apple not expected to deliver a foldable iPhone until late next year, iOS users won't be entering this niche of the market until then. Its a niche product, dont expect samsung to sell millions of these. This product is all about building the brand thats why huawei is doing it also. The world is watching and going WOW look at how cool thats is. I recall Apple fanbois saying the same about "phablets." Can't see them selling millions price is to high. Thats why i say a niche product, I would love one, i will wait for reviews. They can sell a few million and it will still be a niche. Considering how large the market is, after all. The universe was telling you the requested color/carrier combo is sold out. Aliexpress are also selling the Huawei Mate X.
I tried pre-ordering at 4am this morning EST. But unfortunately they were out of the "alien" green and gold combo. They still had the space gray but I don't like that one. At least I saved $2,000 I guess. 9pm on a Sunday night is a random time to do this. haha That gives me a little more time to think about if I want this, or if I want to wait for the Mate X.